So...why didn't the Germans keep up with the Italians? If Italian violins were the cream of the crop - and still are - as the market seems to confirm - how did this happen? Why didn't the Germans keep pace? Or the French, etc? Why would a poorer Giovanni Biscotti still rank higher than a superior Helmut Limburgermeister? Is it ALL just marketing? Just like the whole Betamax/VHS or Apple/android thingy? 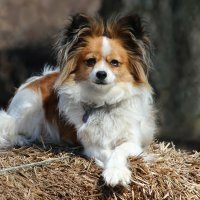 Please see my YouTube attachment on "The Secret" in this other recent thread. They did IMO. Many great German makers throughout most of the history of the instrument. I believe if you look at new hand made instruments (as I often do), the prices of German, American, and Italian are currently comparable. In fact I think there are some bargains among the current crop of Italians. I suppose this would be the moment to remind you that, until c.1800, the violins of Jacob Stainer were considered the finest instruments by many authorities, and some of us think they were not ever surpassed by those Italians. The market confirms value, but that is independent from the quality of the instruments, which you should know, having been here long enough to make over 8K posts. No one knowledgeable about violins would see this as some sort of race in which anyone "keeps pace" with anyone else. Tastes change, markets fluctuate. The value of a violin relates to its degree of separation from a Stradivari (or a DG), nothing else. Being made in the same country as a Stradivari gets you higher up the list and makes up for all sorts of other shortcomings - terrible model, poor workmanship, inconsequential sound etc. For every one of the really good Italian makers post-Stradivari you can find a Prague/English/Dutch/French/South German maker who consistently produces a similar quality of sound for a fraction of the market value. Paganini was Italian. If he were from someplace else and played something else violin history might have gone differently. If you consider violin making as an art, you will see an Italian monopoly in other form of arts in Italy since Renaissance. The reasons for that? Patrons and the Church liked art and payed for it. You just have arts when you have a surplus of money and an elite willing to pay for it. Florence had a population of just about 60.000 souls when it produced the Duomo, Michelangelo, Bruneleschi, Giambologna, Da Vinci, Cellini, Giambologna, etc. Even those prehistoric artists had their stomachs full, otherwise they would be hunting. At the time that Stradivari regained popularity and consequently dominated the violin world, the German cottage industry was thriving and producing less expensive instruments for the market. As demand for violins increased, factories began to appear and machinery came into use in Germany. In comparison, there were still some Italian makers following in Stradivari’s tradition but making far fewer instruments. Markneukirchen was such a powerhouse of production that the instruments made there were readily available all over the world, and goods that can be had easily tend to come cheaply. I think the French were able to establish themselves as a step above the Germans because of the rise of major firms there like Vuillaume. They were dealers of the old Italians and could display their own production instruments in Paris, a major cultural hub. So many stars aligned for the Italian makers—there was the relationship between Tarisio and Vuillaume, which helped to increase the demand for the Cremonese violins; there were fantastic players like Viotti, Paganini, and de Beriot all championing these instruments; and then there were still a few makers in Italy who belonged to families that had been making in Stradivari’s time. 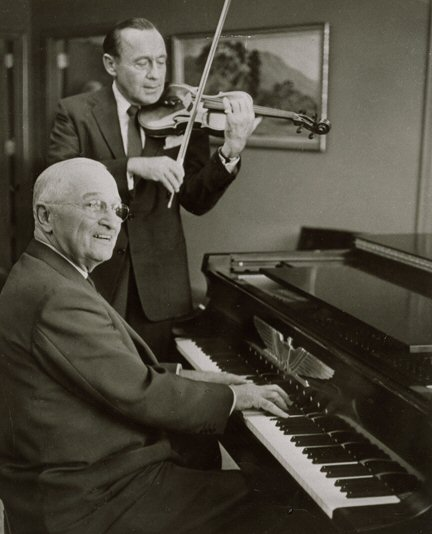 Phil Kass wrote an article about this in one of the Strad Magazines. He talked about the effect of the World Wars on violin values. Spoiler alert, it didn’t help the value of the German instrument even though the price of a good German, Italian, or French violin around 1900 was about the same. 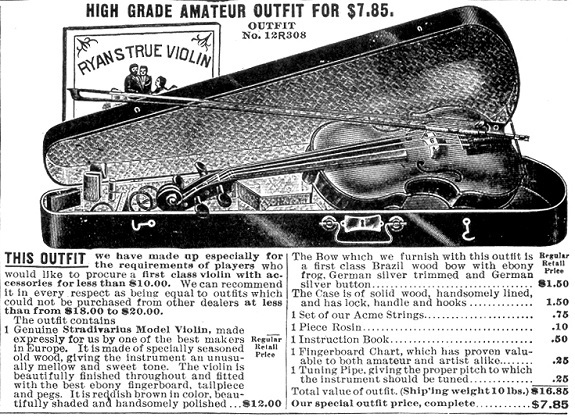 Edit: when I say good violin, I mean one made around 1900. Something like a Bisiach. If you compared the prices of the French, German and Italian contemporaries at that time it was similar. But today the Italians are way more. It,s a culture thing. Having been developed in Northen Italy, the culture essentially centers there. While virtually the same craftsmanship exists in every far flung part of the world, it is only Cremona and Breccia. That,s where it all began. Not much different with any other thing or idea, Japanese sushi, Scottish dirk, African drums, native American pow wow,....the violin of Cremona . Everyone gets to be famous for something! Fact is,Most people, being highly emotionaly driven, want authentic, we may settle for less, but will still want a connection to time, place ,and person, given the option.As we move culturaly into an age where almost everything is entirely uniform and generally disconnected from place, I think it is a natural and reasonable impulse to want some connection to the bigger picture. It,s a culture thing. Having been developed in Northen Italy, the culture essentially centers there. While virtually the same craftsmanship exists in every far flung part of the world, it is only Cremona and Breccia. Yup. While Cremona may not have any instrument-making advantage over any other part of the world these days, there are enough potential buyers who "haven't yet come up to speed" on things like that, that a Cremona address could still be a huge marketing advantage. Sora and Carlson, this isn't in any way targeted at you guys. No comment- just thought it was worth repeating. That is such a good answer you should expand it into article-length. I’m not sure it is completely correct but it sure seems logical to me, and explains the advertising power offamous players and the benefit of location and benefits of-and problems with- mass production. Well done. I think that from the German perspective that they surpassed the Italians. While the rest of Europe was going through the Industrial Revolution, Italy remained primarily agriculture based and sort of "backward" relative to the advances going on elsewhere. In Germany and France, if one wanted to make more violins they made better machines and hired more trainable workmen to assemble the parts. In Italy, you took on another apprentice or two. Ben Hebbert wrote an excellent article positing that Vuillaume was the root of the Italian/Degrees of separation from Strad/relative to Strad pricing scheme. If his violins were, say, worth 1/10 of what a Strad was, then pushing the price of Strads up would make his instruments more valuable. Producing some things is so deeply dependent on the culture involved that making them does not travel well. Violins are not in this category. Whatever the merits of Cremonese violins produced between 1650 and 1750, I feel that tying the prices of modern violins to their geographical provenances amounts to something falling somewhere in the continuum between superstitions and scams. Oh, wow!! They have Mail Boxes Etc. in Cremona!! Maybe I'll add a little cachet to my rubbish. Agreed , thankfully there are lots of really great makers to help dispel the superstitions and waylay the scammers, If I might argue a fine point though, , the culture of violin making ,like many others, would seem best passed on from teacher to student, Not book to student , or web blog to student, I think the violins of the Mexican tiawarra tribe offer an exemplary example of how ideas get made over by culture. Without having the cultural background they supplanted their own construct of what good is. Not saying one can not learn the culture of violin making very well , but without some background , it would take a very special individual to carry it to the highest level. People are strange , the violin world even stranger, on one hand , we only become involved with them because of an emotional response, On the other ,one must be very critical of detail,or risk being taken advantage of. I'm not referring to DIY violinmaking acquired at arm's length, but to the output of professional makers and manufacturers. So far as I can determine, the production technology of violins, like watches or household appliances, is thoroughly cosmopolitan, to the extent that what maker or manufacturer produced them (which has an effect on quality) is far more telling than where they did it. The ideas used have dispersed everywhere on Earth, and are being taught similarly everywhere. Everybody in the business has access to enough information to flawlessly produce any style they want, if their skills are up to it. Compare this with objects which are bespoke productions within a particular localized culture, and you'll see what I mean. Consider a track shoe. Without a label, you can't tell if it was made in Herzogenaurach, Jakarta, Hanoi, or Zamboanga. The same isn't true of a trachten dirndl, a shadow-puppet, an ao-dai, and a bolo. I'm saying the violin has become like the track shoe. I have a Stradivarius t shirt !....Personally I think we're missing the Stradivari action figure, with new movable limbs! "look mommy, he's practicing his gouge sweeps!" Just thinking that the Germans found a way to provide much needed income to a lot of people. I don't know what that was like in Italy at that time, but those instruments served a needed purpose, including providing cheap violins for people who didin't need a fancy instrument with a name inside that probably wouldn't have made any difference to the person who bought it. I suspect that the total worth of all the Germain violins ever produced is much more the total worth of all the Italian violins produced. Probably many more people found joy playing music with Germain violins. So why didn't the Italians keep up with the Germans? Just thinking that the Germans found a way to provide .................. cheap violins for people who didin't need a fancy instrument with a name inside that probably wouldn't have made any difference to the person who bought it. I beg to differ. They provided the names inside as well. Thousands of "attic Strad" queries on MN bear witness to this. Ok let's take the 1,200 Strads and DGs at a conservative value of $5M each (6000M), a couple of hundred Guads at 1.5M plus a hundred Bergonzis for a bit more (500M), then all the 2000 or so violins that would sell for $500k (1000M) and lump in all the Pressendas and Roccas, Cerutis etc etc (60M?). This gives us a total of 7,560 million dollars. Oops forgot about Amatis ...! So maybe 10 Billion in total for the Italians. Let's take about 700 Strads and DGs instead. Anything produced in huge quantities isn't a good fit to the "rare collectables" market. And many more Strads were made in Germany than in Italy.